Basketball, baseball, football, and soccer champions depend on it for their trophies and bats. It makes our metal pans and trays square for us to bake and cook on them inside of an oven or toaster. All fabric manufacturers use it to cut up materials such as plastic, wood, and all other kinds of fabrics. We are talking of nothing else but a laser cutter. This cutter is likely to be one of the most wide-spread tools found in fabric industries as well as in so many other industries. Its importance, especially in cutting sharp edges, cannot be discounted. Beams that hold up buildings could never be as sharp without a fine smooth laser finish around the edges and sides. Stones and metals would be very difficult to engrave so precisely unless computer programmed laser cutters did the job. In fact, so many things around us are finished off with laser cutters. We are affected by laser cutters in so many ways, and we don’t even realize it. We need to understand the recent shift in people who instead of using traditional methods of cutting such as welding and other mechanical forms of cutting, have turned to laser cutters. There must be something pretty good in these cutters regarding speed and efficiency. It would appear to be that because, firstly, when cutting with a laser, there is definitely a space between the human and the object being cut and no physical contact. This helps prevent injuries. Traditional cutting industries spend quite a lot of cash in treating their workers of major and minor injuries. Sometimes the injured person dies if the cut was too deep. With laser cutting, such is avoided because the process is just computerized. 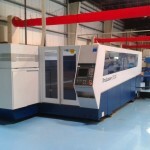 With laser cutting, there is no contamination. Because there is no cutting edge, nothing can contaminate the material, and for that matter, the material cannot contaminate it either. Additionally, there is a much lower chance of warping the material that is being cut out. This is because laser heaters have a very small heat-affected zone. Needless to say, a clear benefit is the ease of cutting with a laser materials that traditional methods might have taken hours to cut. Although there is a high amount of energy that is required, the benefits of a laser cutter have proven to be tremendous.The cost of procuring this technology should not scare anyone because, in the long run, you will save more than if you were to go for traditional cutting.